If you were given the chance of travelling to a distant planet to mine an invaluable resource, would you? The terms are tempting, do the journey and the Babel corporation will make you richer than you could imagine, and it will only take away one year of your life. But what if the trip is going to cost you more than time...? 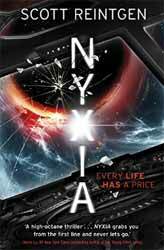 Nyxia (2017. 371 pages) is the first book in a new Nyxia Triad series of novels written by Scott Reintgen. The main protagonist is a young boy of colour, Emmett, he is one of ten young adults who have been chosen to travel to the planet of Eden to mine the miracle substance, Nyxia. They are chosen because the natives have reacted violently to adult incursions but seem to revere children which conveys immunity from violence to the new recruits. They quickly discover that they have all come from poor or deprived backgrounds and so all carry baggage. I was concerned that because of his colour and background that Emmett would come over as a stereotypical angry young man, but while this is an element of his personality Reitgen has been careful to round out his character with a loving family with progressive values. His decision to undertake the trip is given further impetus when it is revealed that his mother has cancer and the family cannot pay the needed medical bills. While the children have similarities in their backgrounds they come from all over the planet and most, if not all, races are represented in the group and the diversity works well for the story. Together they find that the deal of a lifetime has just one catch, only eight can go to the planet, two will be eliminated during the trip via a series of more and more complex and dangerous tests. In a broad brushstroke way, the core of the novel is not dissimilar to Orson Scott Card.’s Enders Game (1985). The McGuffin is the Nyxia. Found only on Eden, it is a black substance which can be made to imitate any non-biological structure, limited only by the wielders strength and ability. As such it can be made to imitate walls, floors, barriers and weapons. My initial concern was that I wasn’t sure how long the writer could keep the reader’s attention if all we were to witness was a series of trials. However, the author has presented a well layered story involving Emmett’s growing relationships, both good and bad, as well-defined character progression, especially for Emmett. There is also a running theme involving Babel. As the tests become deadlier, through Emmett, we are asked to question both the methods and motivations of Babel. It’s quite a clever trick to be able to present an entity with enough shades of grey that you are never sure if the children are being put through their ordeal to guarantee their survival in a hostile environment or if there a more sinister reason for the games. Of course, the biggest success of any novel is how gripping it is. I sat and read the book in one long day sitting. It’s a story which really pulls you in and keeps your attention for the whole ride. If I had to level one criticism it’s that it ended with so much more to know and discover, guess I’ll have to wait for book two.